Organize an event to help people choose electronics gifts that actually give more than they take. The Giving Guide is an easy-to-use resource that can make a difference in what people buy. We just need to get it in front of them. Can you help us spread the word by organizing a Giving Guide Giveaway? Giveaways are public meet-ups where free software users gather to hand out our attractive Giving Guide flyer to shoppers trying to decide which electronics to pick up. By having face-to-face interactions with people in your area, you'll be getting your message across way more effectively than we can by talking about it online. We've created this primer to get you started organizing a Giveaway. Get a few friends together for a small Giveaway, or make a splash with a big one -- it's about spreading the message in whatever way is best for you. If you aren't able to run your Giveaway in December, don't let that stop you; shopping doesn't end with the holidays. If you're considering organizing a Giveaway, get in touch with us at campaigns@fsf.org -- we'll help you promote it and offer support. Translate this guide! Start with the instructions in the included README file. You can also use the 2014 versions for reference. The times here are just suggestions, and many great actions have been planned with much shorter timelines, so if you're starting a little late, don't despair. Pick the date and location sooner rather than later. The more lead time, the more people will come. If you aren't sure where the Giveaway will happen, it's still worth it to start asking people to save the date. Once you pick your date and meeting place, email us at campaigns@fsf.org. If you like, we'll send an email to free software supporters in your area promoting your event. If you're not sure how to invite people, try our sample promotional email below. If you want to get more people than your immediate friends and family to come flyer, good places to start are local free software groups like LibrePlanet teams, any projects you contribute to, and your office. Plan to go out and eat or drink after you flyer. This makes the event more festive and fun and is a good way to get to know others that care about computer user freedom. Have passersby that have a reason to care, like shoppers at an electronics store, tech professionals, or engineering students. Are convenient and cheap to get to. Public transportation is best. Are indoors (if you live in a cold place). Examples include Best Buy, Windows Stores, Apple Stores, Walmarts, and malls that include any of these stores. If you attempt to flyer inside a store, security will probably ask you to leave. Because of this, it's best to stay on the sidewalk or in the closest hallway, if your store is in a mall. The flyer version of the Giving Guide looks great in black and white or color, and is best when printed double-sided. How many flyers you want to print depends on the number of people you expect to be flyering. For a reasonably well-trafficked area, we recommend about 30-50 flyers per person flyering. As organizer, your job is to make sure that everyone is comfortable and is having a good time. It's easier to talk to strangers if you practice a few times first, talking to each other. Another trick is to brainstorm a "stop line" beforehand, that you can say to a passerby while you hold out a flyer. For example "Would you like a Giving Guide?" or "Interested in tech gifts?" It's also more fun to flyer in pairs rather than alone. Relax and try to have fun! Though many people won't want your flyer, lots more will be excited to talk, and you might have some great conversations. Once you get started, it's good to go for thirty minutes to an hour. At the FSF, we like to dress up when we flyer, often as gnus. If you've got any costumes or clothes that are even vaguely holiday, shopping or freedom-related, now's the time to bring them out. If you are asked to leave by a security guard, do so immediately and respectfully and head to another store near by, if you can find one. When you are done, leave any remaining flyers somewhere that people will see them, on a bench or a table. Don't forget to take photos of people handing out flyers and send them to the FSF at campaigns@fsf.org! We'll post them on our Web site in our wrap-up post for the actions. Title: Want to join me for a free software gathering? I'm planning a special outing this year to make a statement about computer user freedom. 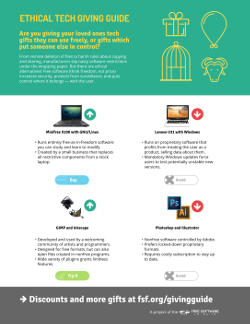 The Free Software Foundation (https://fsf.org) creates a Giving Guide every year that helps people pick electronics gifts that serve the people receiving them, instead of giving control to someone else with proprietary software or DRM. This year's guide is at https://fsf.org/givingguide. Want to join me and hand out some giving guide flyers to shoppers, and then head over to restaurant for food/drinks? By having face-to-face interactions with people in our area, we'll be getting our message across way more effectively than anyone can by talking about it online. We'll meet up at location at time, stay until time, and then head to restaurant. Please RSVP to let me know you're coming. Hope to see you there! Have questions or suggestions for improving this primer?